B U B B L E G A R M: Are they the same? I have managed to get my hands on the very desirable 'Ever Hip' from the Liberty of London collection via a swap so I can now compare it with 'Jazzed' lipstick from "In the Groove". When swatched they look very similar, Ever Hip is a tinge more pink, but essentially they are the same colour even when applied to the lips. You really can't tell them apart, if you want to be fussy then Jazzed has a slightly more muted finish. Do I need both? No. Do I want both? Yes. Why? Different packaging, the slight tone difference is enough for me to justify having both because I'm greedy, plus they are both limited edition and are VERY pretty colours perfect for Summer. I also did a swap with the gorgeous Ebru, I was having withdrawal symptoms over the Maybelline dream SMOOTH mousse aka Dream Creamy in the UK. The shades we have in the UK are rubbish compared to the US. My shade is Natural Beige. She also sent me the NYC creme stick (blush) in 'Plaza Pink' which is very beautiful, the consistency isn't greasy making them perfect for hot weather, I would highly recommend you check them out if you are in the US as they are fantastic value for money. She also sent me a NYX lipgloss in 'Smokey Look' and a jumbo pencil in 'Milk'. This is the kind of thing I would say to someone too! :) So adorable! Tried any of these products? What's your opinion? LOL I WANTED and I NEEDED them both. I felt like it was a physical pain if I didnt get Jazzed! You see a good peach is very much hard to come by in the world of MAC. They will mostly likely come up with another one and repromote these.. and ill probably buy them all again! They are gorgeous colors but they look so similiar and dream mousse concealer is my favorite. Great swap! Hi Mushine, Love jazzed, but hard to get now. I'm jealous. I have Milk jumbo pencil too, you can get them from lovemakeup.co.uk, at quite a reasonable price. I picked the Dream Creamy foundation a few days and I love it. My shade is just close to the 48 sun beige but the one below was too different!. A bit silly to change the name to market it in the UK. To me that "adaptation" is a bit pointless and confusing. Don't you think? Wonder the reason behind it. I love the glowy finish of this foundation and I apply it with my 187 You only need very little and it covers very well. The only bad thing is that it only comes in a 14gm pot. Is the American version as tiny as the one we get? @Mercedes yes the pot is tiny, very little product for such a large container, I don't understand why they confuse us with names and shades, bad bad maybelline!!! Wow, they do look very similar!! And I LOLed at the thank you note. That's so cute! I missed out on ever hip, so I was excited to get jazzed and love it. They do look VERY similar! I wanted Ever Hip but by the time I realized that, it was gone forever. (I'm not even gonna complain about the Blooming Lovely fiasco anymore lol) Hey at least I got Jazzed and I loves it! :) Glad you enjoyed the stuff and the card! I'm preparing my side of the swap, awww! Thanks so much again Muhsine, you're such a sweetheart! :)) XO! the smokey look lip gloss looks great over Jazzed! The lippies are very similiar, both are very pretty colors. It's funny how we always want what we can't have, without a little effort anyway. You are going to love the NYX jumbo pencil! I skipped ever hip but bought jazzed, it's soo pretty on my hand but just doesn't seem to work on my lips! :( I'm hoping a nice tan will do the trick! I love the smooth mousse and nyc blushable cremesticks! I have everhip but missed out on jazzed. This makes me feel somewhat better knowing they are very similar! They are very similar but both are so pretty for summer that I don't blame you for having both! awesome review! 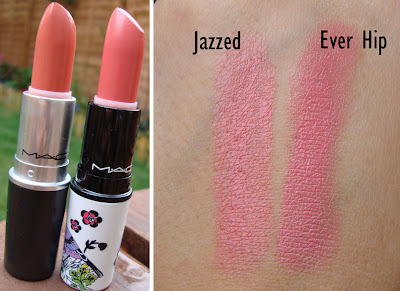 i love the color Jazzed, i might just need go check that out at MAC and i got the cremeblush and i love it! its affordable with quality! I have both Ever Hip and Jazzed and I also perceived that they are pretty much the same. I wish I had read this befoe getting Jazzed some weeks ago! I would not have skipped Ever Hip maybe because of its cute packaging, which I adore! those two lipsticks are almost identical. I think I want both anyways, lol! I really want to try the blushable cream sticks but I can never find them anywhere. Any advice on where ppl have found these?